Ask any user how they first learned JMP, and there’s a good chance that they’ll cite JMP Essentials – An Illustrated Step-by-Step Guide for New Users as a resource they relied on. Authors Curt Hinrichs and Chuck Boiler have written a second edition of this very popular book that promises to be even more helpful to new JMP users. 1. 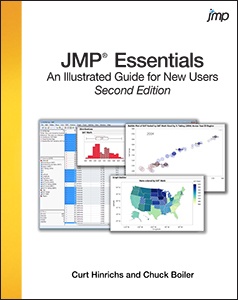 The first edition of JMP Essentials taught thousands of users how to use JMP. How is this new book different? Curt Hinrichs: Well, it’s hard to believe that the first edition, which was based on JMP 8, was published five years ago. And we felt a second edition was a long overdue given we have seen four major releases of JMP since then. There were certainly a number of new features that we needed to introduce to readers of JMP Essentials, and we added 10 new sections to the book to cover these. But what really compelled my thinking in the revision were the workflow improvements that JMP introduced. These may be a little more subtle on the surface, but I find these to be significant timesavers, which help our users stay in the flow with their analyses and discover insights in their data faster. Chuck Boiler: JMP Essentials, 2nd Edition, has been updated to take advantage of the latest features of JMP. So one of the most exciting features introduced in JMP 12 is the way JMP handles missing data. In a nutshell, you get more information faster when using JMP Essentials, 2nd Edition, in conjunction with JMP 12, even when some of the data is missing. This is a major improvement because almost no one has complete data despite what most statistics text books say. 2. What is the most common question you get asked by new users, and what do you tell them? Curt Hinrichs: I work with academic customers, professors mostly, and I think the most common question I hear from them is really about the fundamental shift from a technique-driven to data-driven mind set. That is, "How do I begin to adopt JMP’s data-driven navigation and pedagogy in my course?” This mind set is not exclusive to academic users, and we hope JMP Essentials will continue to help a wide range of curious people explore their data and make interesting discoveries and share them with others. We have organized the contents of JMP Essentials to try to help the reader see and understand this process. Chuck Boiler: The question that makes me laugh is “Isn’t JMP just a fancy spreadsheet?” That’s a great starting point for a new user because new analysts can use everything they learned using spreadsheets to become a better data analyst using appropriate software. The major difference in using JMP and the second edition is the faster learning rate it enables. The speed with which you gain knowledge and insight from data should be the metric the data analysis process is measured by. The aim of JMP Essentials is to increase the learning rate to the maximum. 3. When you are not working, what do you like to do? Curt Hinrichs: I like to spend time with my family, my kids’ soccer games, golf, tournament poker, woodworking and working out. I also enjoy reading history and historical fiction. Chuck Boiler: I’m a huge dog lover, and I love walking. I also enjoy cooking without recipes, which is sort of like driving without a license, but less dangerous. This blog post is part of a series of posts that celebrate the 25 years of SAS Press. We're also marking this milestone by offering customers 25 percent off their entire order from the SAS Bookstore. Use promo code SMPBBP. Discount ends Dec. 31, 2015.